Tart can be prepared through Step 3 two days ahead and refrigerated. Bring to room temperature and blot surface dry with paper towel before topping with meringue. Tart Shell Step 1: Lightly butter a 9 x 1 inch tart pan with removable bottom. In food processor, pulse flour, confectioners' sugar and salt to mix. Add butter and shortening; pulse until mixture resembles coarse crumbs. Pour egg mixture over crumbs; pulse until dough starts to clump together. Remove dough from food processor and squeeze together into a ball. Press dough evenly over bottom and up sides of pan, slightly extending about 1/4 inch above the top edge of pan. Freeze shell 30 minutes. Tart Shell Step 2: Adjust oven rack to bottom third of the oven. Heat oven to 375 degrees F. Remove crust from freezer; line with nonstick foil tightly against bottom, sides and top edge of crust. Place tart pan on baking sheet; bake 25 minutes. Carefully remove foil; return crust to oven 5 minutes (if crust puffs, gently press it down). Cool completely on rack. Reduce oven temperature to 350 degrees F.
Filling: Whisk ingredients until blended and smooth; pour into crust. Cover crust edge with foil or pie shields. Bake 50 minutes or until filling is set and crust is golden. Transfer to a wire rack and cool completely. Meringue Step 1: In a small, heavy saucepan, bring sugar and water to a boil; stir just until sugar dissolves. Boil, without stirring, 4 minutes. Meanwhile, in large bowl of stand mixer, beat egg whites at medium speed until soft peaks form. Beating constantly, slowly add mixture to whites in a thin, steady stream. 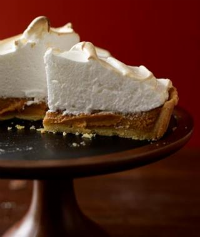 When incorporated, increase speed to high and beat meringue until stiff yet billowy glossy peaks form. Meringue Step 2: Heat oven to 425 degrees F. Remove sides of tart pan and place tart on a baking sheet. Loosen bottom of tart pan from crust with an offset spatula; leave pan bottom in place. Starting at edge of crust, spread some meringue over filling, sealing it against the edge of the crust and mounding meringue high in center; make decorative swirls in meringue. Bake 5 minutes or until swirls and tips are lightly browned. Let cool. If desired, slide tart off pan bottom onto serving plate. My Favorite Family Fun Time Activities!